Where those above destroy, those below reconstruct! The Tzeltal people are being dispossessed of their land, water and culture through paramilitary repression, for the construction of tourist complexes, as well as roads and hotels, at the waterfalls of Agua Azul. 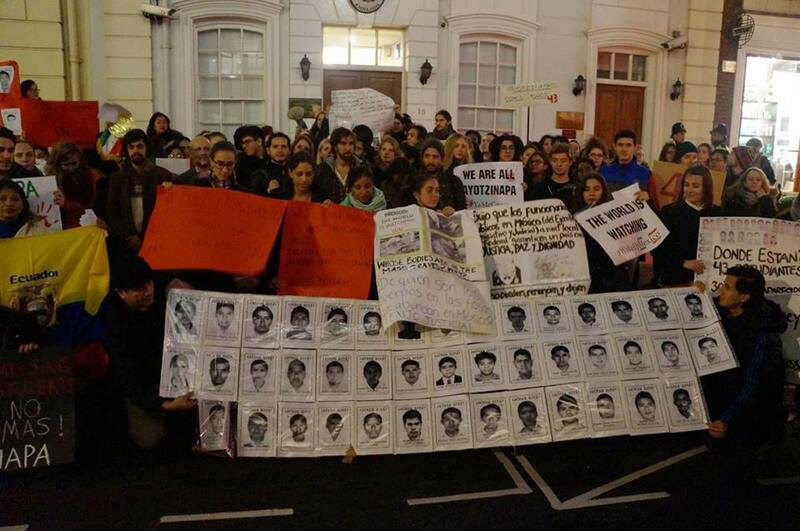 On November 28th—more than two months after the enforced disappearance of 43 students of the Normal Rural School ‘Raúl Isidro Burgos’ of Ayotzinapa committed by municipal police in Iguala, Guerrero—over 200 people demonstrated outside the Mexican embassy in London, UK. Since the tragedy occurred, there have been over 10 actions in London to demand the presentation of the disappeared students alive, and to remember and demand justice for the tens of thousands disappeared people in the country. 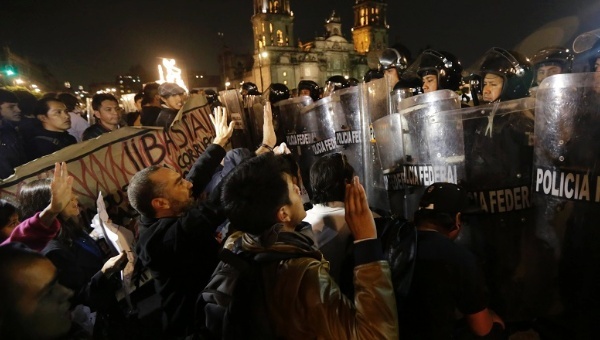 These actions have denounced the ongoing human rights crisis in Mexico. 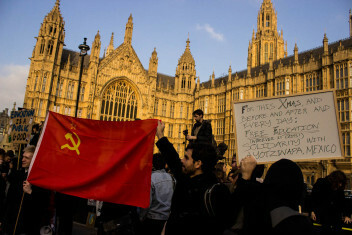 People in more than 15 cities in the UK have organized demonstrations of solidarity with the missing students and their families. In these the international community has joined the demands of the families of the disappeared students, and has done so with greater force as the ineffectiveness of local and federal governments to respond to this crisis becomes evident. 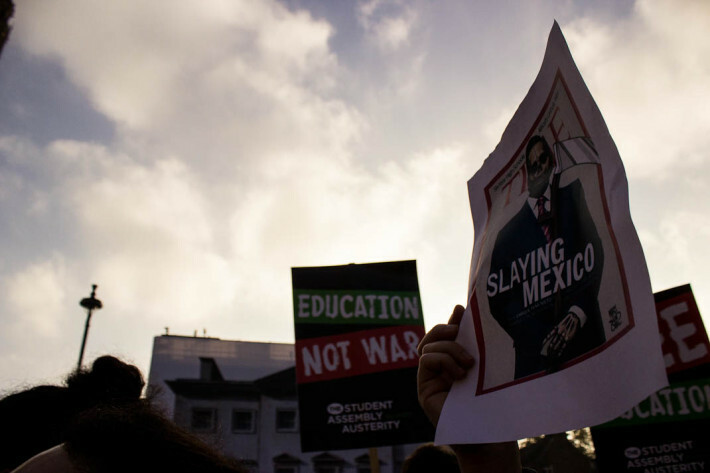 This time, the protest was organized by the University College London Union (UCLU) and the National Campaign Against Tuition and Cuts to Education (NCAFC), and was supported by YoSoy132Londres and London Mexico Solidarity Group. 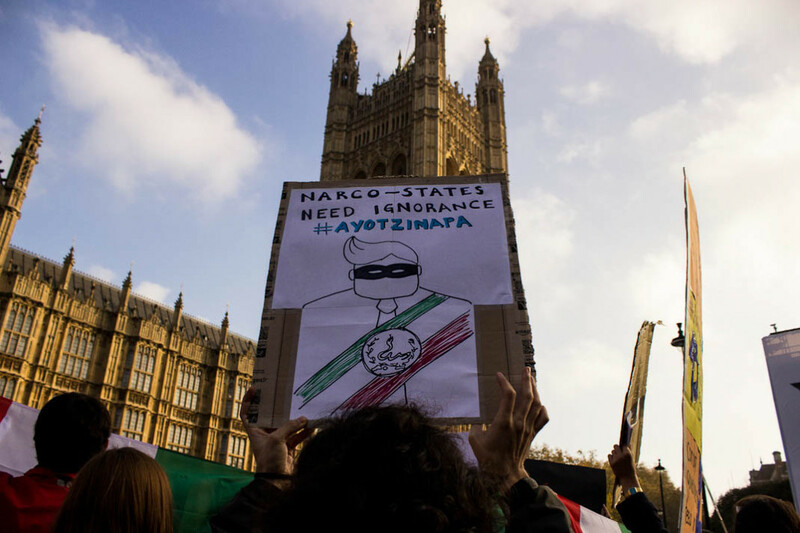 The National Union of Teachers, Peoples National Assembly and Londoners showed their solidarity and demanded the government of Enrique Peña Nieto acknowledge the human rights crisis that exists in Mexico and act accordingly. The direct responsibility of Miguel Ángel Mancera and Enrique Peña Nieto in the repression of last November 20th was stressed, and we demanded the immediate release of the 11 political prisoners who were arbitrarily arrested that day. 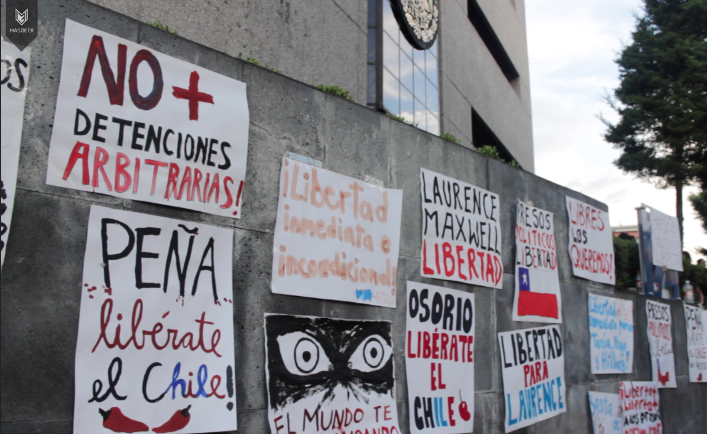 Among the messages of solidarity, the Chilean community drew attention to the arbitrary detention of the Chilean student Laurence Maxwell Ilabaca on that day. 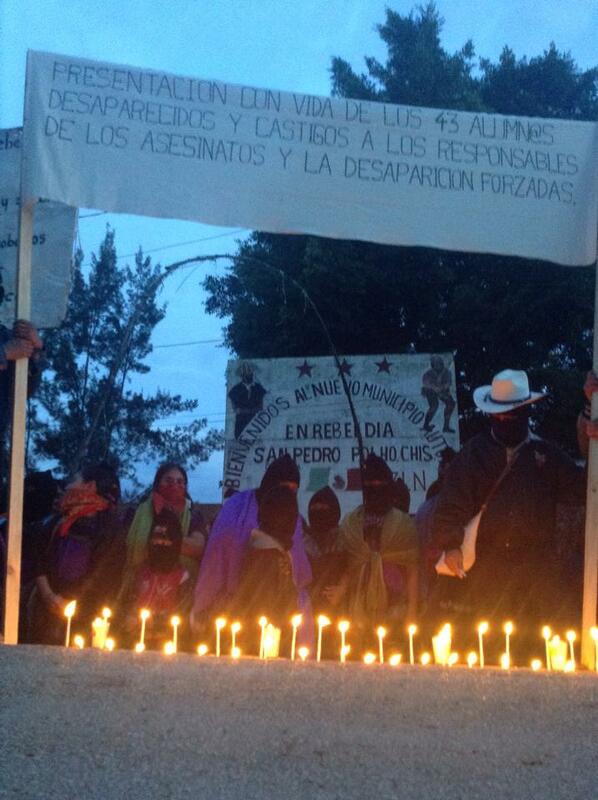 As we do in every manifestation, we read the names of the 43 disappeared students. We also read a letter which was delivered to the embassy personnel. It is to be noted that the responsible for “protection of Mexican people in the UK”— according to the Mexican embassy’s website— took some pictures without introducing himself as member of the Mexican delegation. This letter is delivered as part of today’s protest at the Mexican Embassy in the United Kingdom, a protest organized and officially endorsed by University College London Student Union, Kings College London Student Union and the National Campaign Against Fees and Cuts. These organizations, and the undersigned, are profoundly concerned with the role of the Mexican state in the events that took place on September the 26th, 2014 where the municipal police of Iguala, Guerrero, attacked the students from the rural teacher-training college Raúl Isidro Burgos, of Ayotzinapa, killing six people, torturing at least one of these victims, injuring 20, and allegedly handing over 43 students to the organized crime. On November the 7th, the Attorney General, Mr. Jesús Murillo Karam, suggested in a press conference that the 43 disappeared students had been killed based on three testimonies. By pretending that the investigation into the matter is advancing, the government sought to appease the national and international pressure providing a false image that things in Mexico were under control. However, Mr. Murillo Karam had to admit that the investigation is still incomplete and that the results are inconclusive. According to Amnesty International, the investigation “has been biased and incomplete, failing to challenge the entrenched collusion between the state and the organised crime which underlies these grave human rights violations”. The relatives of the students and international observers have pointed out that investigations undertaken by local and federal governments have severe deficiencies. Since there is no scientific proof of what the Attorney General announced (on his own admission), the students remain disappeared and we demand they are found and sent back to their families ALIVE. On November the 20th, mass demonstrations against the government’s response to the disappearance of 43 students in Ayotzinapa, Guerrero took place (more than 250 protests not only in Mexico but also at the Global level). Hundreds of thousands of people have marched peacefully throughout Mexico City in the largest demonstration yet seen. Nevertheless, episodes of police brutality in Mexico City’s Central Square have been widely documented. Eleven youngsters arbitrarily detained the night of the 20th of November were sent to the maximum security prisons far from Mexico City, charged with terrorism, riot, attempted murder, and organised crime. We demand that the 43 disappeared students are brought back to their relatives alive immediately, and that everybody who has been responsible for this be taken to court. More than two months have passed since the State committed this crime. 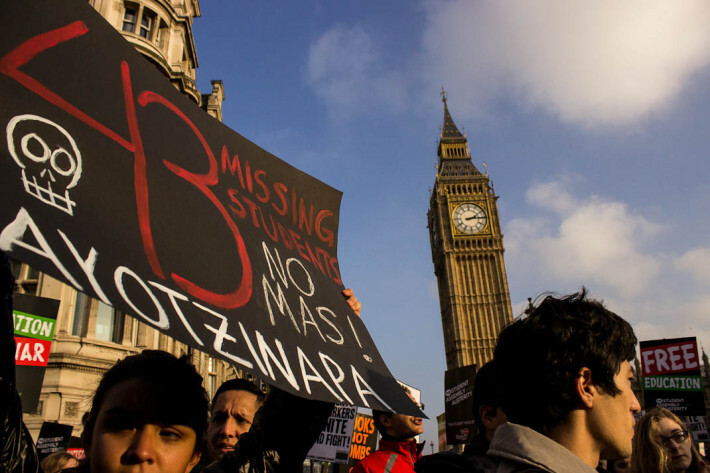 We urge the Mexican government to stop hindering the investigation and to give a complete, accurate and reliable report about the whereabouts of the 43 students. If Mr. Murillo Karam is not able to lead a reliable investigation we demand him to immediately resign and to be judged for obstructing the course of justice. Juan Daniel López Ávila, Laurence Maxwell Ilabaca, Hugo Bautista Hernández, Tania, Ivón Damián Rojas, Liliana Garduño Ortega, Atzín Andrade González, Ramón Domínguez Patlan, Roberto Jasso del Ángel, Luis Carlos Pichardo Moreno, Hillary Anali González Olguín and Francisco García Martínez. In order to make sure that the embassy is collaborating with the interests of Mexicans, we urge you to put pressure on your colleagues in the Federal Government to do justice by releasing these prisoners and to give us information about the legal status of each of these political detainees. We demand the Mayor of Mexico City, Mr. Miguel Ángel Mancera, and the President Enrique Peña Nieto assume political and legal responsibility for the repression of the civil population and for using undercover police to initiate violence. 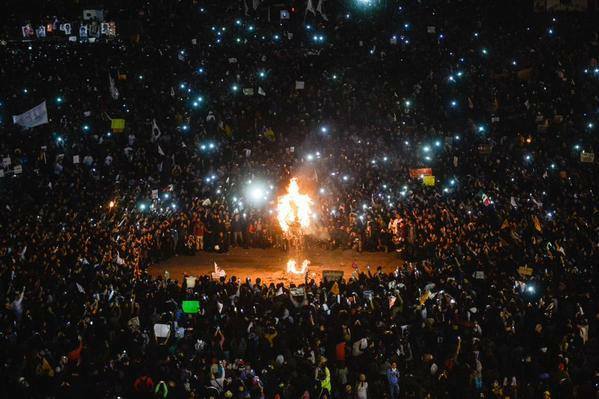 We demand that the right to protest and of freedom of speech is guaranteed for all in Mexico. We urge you, Mr. Gómez Pickering, to immediately cease the marketing campaign that is giving a false image of Mexico to foreign investors. As a representative of the Mexican People in the UK you should immediately recognize the crimes committed by the State in Iguala, Guerrero and the humanitarian crisis that is going on in Mexico. If you do not give us any meaningful, substantial and practical feedback within a week, we respectfully ask you, in the name of trust and accountability, to resign from your post. 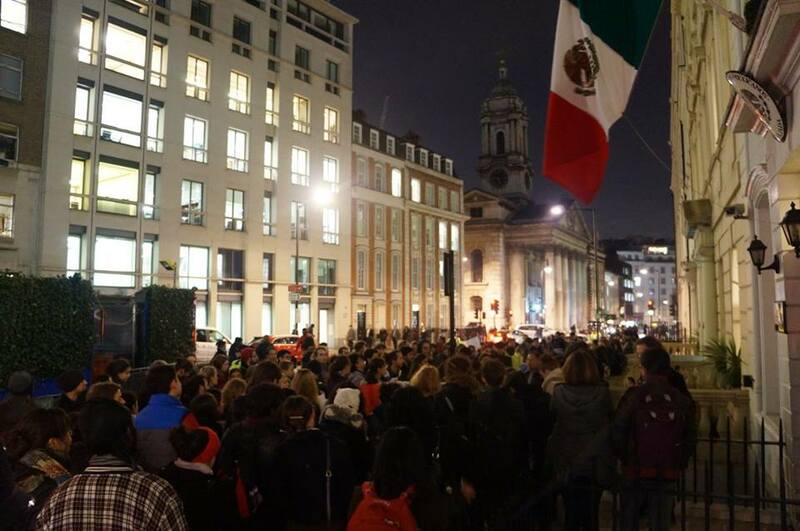 Unlike the Mexican embassy and the Mexican government, members of the society of the United Kingdom have showed their solidarity and defended the rights of Mexicans to protest and to live a life in peace. 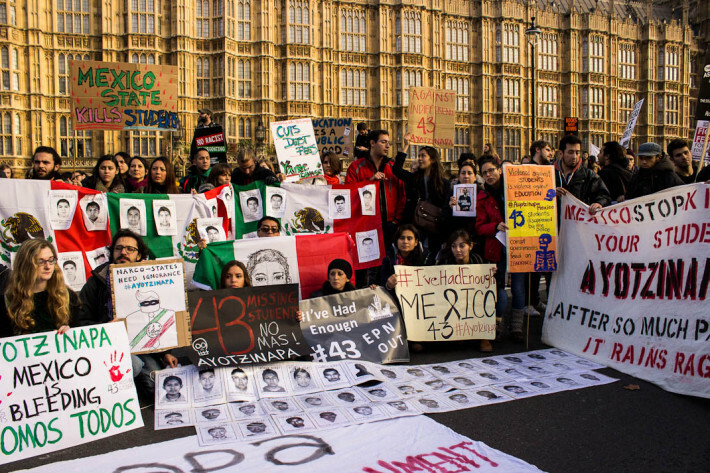 More than 40 UK Members of Parliament have signed a motion in relation to Ayotzinapa. Yet, unbelievably, this Embassy has not mentioned a single word about this humanitarian crisis, even when its official website shows off the commitment with human rights as part of its mission. We demand from you not just words, but effective actions. You can start by recognising the incompetency and the multiple crimes committed by the Mexican government. Alliance for Workers’ Liberty, Ayotzinapa Nottingham Collective, Cambridge Mexico Solidarity, Collective for Social Justice in Mexico (Athens – Greece), Dorset Chiapas Solidarity Group, Edinburgh Chiapas Solidarity Group, Glasgow for Ayotzinapa, KIPTIK Bristol, Imperial. College Latinamerican Society, London Mexico Solidarity, Manchester for Ayotzinapa, Manchester Zapatista Collective, National Campaign Against Fees & Cuts, Sheffield-Mexico Solidarity, Socialist Worker Student Society, Sussex Students for Ayotzinapa, UCLU Marxists, UK Zapatista Learning and Teaching Collective, UK Zapatista Solidarity Network, UK Zapatista Translation Service, York Mexico Solidarity, YoSoy132Londres, Zapatista Solidarity Group – Essex. Even before the tragic kidnapping of 43 students from the Ayotzinapa teachers’ college in late September, Mexico’s President Enrique Peña Nieto was already teetering on the brink. His neoliberal reform agenda, systematic repression of protests and iron-fisted control over the media had turned him into the most unpopular president in recent Mexican history. 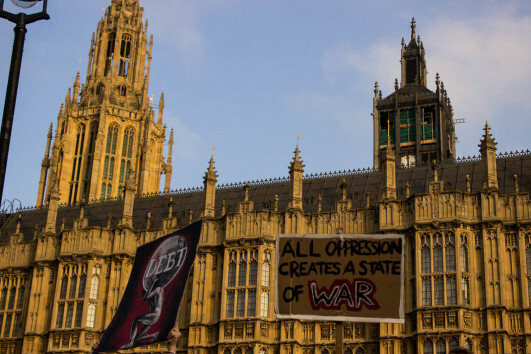 The enormous unrest that has erupted in recent days is, therefore, not only about criminality and violence but also social power and democratic politics. And what is at stake in today’s battle for Mexico is not just the future of peace and prosperity for those living south of the Rio Grande but also democracy and justice north of the border. Obama, the U.S. military and Congress eagerly accepted Peña Nieto’s Faustian bargain. They would blindly support his presidency in exchange for quick action on energy reform. Over the last two years, both sides have loyally held up their ends of the deal. In December 2013, Peña Nieto pushed through historic reforms to Article 27 of the constitution that broke up the state monopoly over the oil industry and opened the floodgates to speculation and vast private investment by international oil giants. The majority of Mexicans adamantly rejected these reforms, but they were steamrolled through the National Congress and passed by a majority of the state legislatures in only 10 days without debate and in flagrant violation of the democratic process. Such quick legal action authorizing the transfer of public oil rents to private hands fulfilled the wildest dreams of Washington. The U.S. has pushed for years without avail to achieve similar reforms in occupied Iraq without success. But in Mexico a loyal and corrupt president proved to be much more effective than direct military occupation. Recent actions by Mexican authorities suggest that they continue to have the undying support of Washington. Since Peña Nieto took power, the U.S. government has not issued a single condemnation of corruption or human rights violations in Mexico. This in a context in which leading international organizations such as Human Rights Watch, Article 19 and dozens of local NGOs have documented a scandalous increase in the repression of protest and violence against the press during the present administration. The muted response by the U.S. government to the Sept. 26 student massacre is part of a broader trend of looking the other away. But the U.S. government has not just stood by the sidelines. It has also ramped up its direct involvement with the drug war in Mexico. Congress has appropriated billions of dollars to fund the Mexican government security apparatuses in recent years. Mexican and U.S. authorities have set up elite fusion centers throughout the country for sharing intelligence information. And The Wall Street Journal just revealed that U.S. agents dress up in the uniforms of Mexican military personnel to participate directly in special missions, such as the recent arrest ofJoaquín “El Chapo” Guzmán, the powerful leader of the Sinaloa cartel. 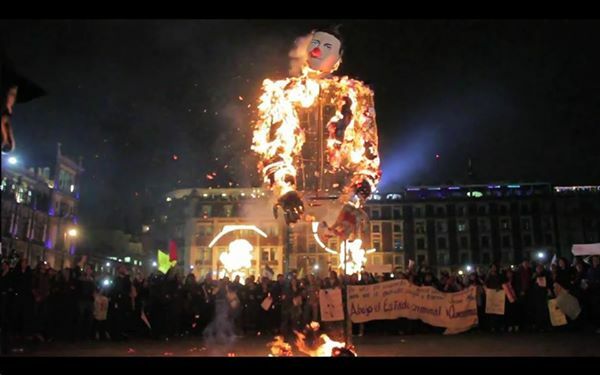 Now that the legitimacy of the Peña Nieto administration has come tumbling down like a house of cards, starkly symbolized by the public burning of an enormous effigy of him in Mexico City’s central Zócalo Square last Thursday, the question on everyone’s minds is whether the United States government will fight to the end to defend Peña Nieto or if there is still any room in the U.S. political establishment to maneuver for peace and democracy south of the Rio Grande. Recent actions by Mexican authorities suggest that they continue to have the undying support of Washington. According to multiple witnesses, during the enormous protests Nov. 20 in Mexico City masked provocateurs firebombed police and then stood by and watched as authorities indiscriminately manhandled journalists and human rights observers and detained innocent students. Peña Nieto immediately accused 11 students of serious federal crimes such as terrorism, organized crime and conspiracy and has locked them up in high security prisons hundreds of miles from the capital. And this Sunday, Mexico’s powerful Secretary of the Marines, Gen. Vidal Francisco Soberón, gave an unprecedented display of political activism when he publicly stated that the armed forces are not only committed to combating organized crime and narcotrafficking but are also ready to intervene in support of Peña Nieto’s neoliberal political project to “move Mexico.” WikiLeaks cables and independent reports have revealed that the U.S. government is particularly close to and prefers to work with the Mexican marines over other Mexican law enforcement institutions. Mexico has a better knowledge of the number of gallons of oil it exports every day than it does of the number of disappeared persons it has in the country. This gives a true picture as to where the Mexican State’s priorities lie, states Ariel Dulitzky, president of the UN’s Working Group on Enforced or Involuntary Disappearances. 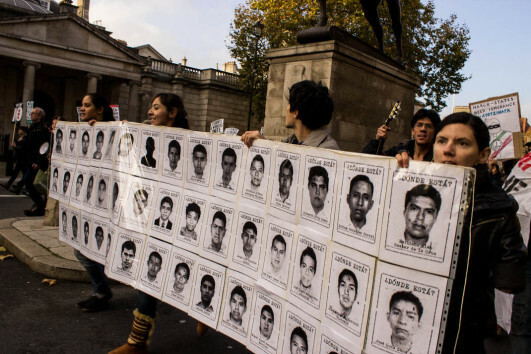 “It is profoundly disconcerting; the disappeared persons are mixed in with lost and unidentified people; there is no plan for disappeared persons in Mexico, no genetic database,” he stated. He stated that the Iguala-Ayotzinapa case is unique and unprecedented, regarding the number of forces who are looking for the missing students, if the ten thousand troops from the federal forces are counted. “In general, the government has not responded to the needs that they have in the face of a high number of enforced disappearances,” he stated. 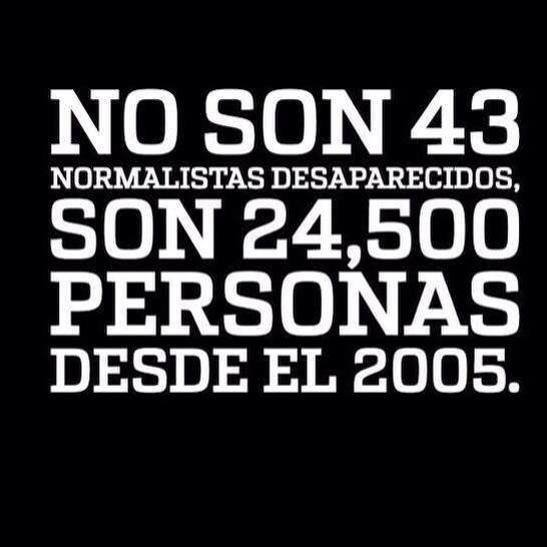 It isn’t 43 normal school students disappeared, it is 24,500 people since 2005. “What we see is that it is an extremely difficult challenge and one that still has not been overcome. We believe that there are many doubts, many problems that should be a turning point, a watershed moment in Mexico’s history on how the subject of forced disappearances is handled. To this day the government has not taken on this sad fact as a political opportunity to adopt general public and structural policies to prevent these events in the future, to look for missing persons, not just for the 43,” he added. He affirmed that there are 43 disappeared persons and not a single one of the 80 detainees is charged with forced disappearance, not a single one. They are all cases of kidnapping or organized crime, but there is no legal concept for forced disappearance. Even if they manage to convict anyone, no one will be convicted for forced disappearance, at least as they are being held today. Even though [forced disappearance] may be defined in the law, the definition is insufficient, Dulitzky stated. He also remarked that the National Human Rights Commission says that there are more than eight thousand unidentified remains in the country. If there were a genetic database, eight thousand disappearance cases would be solved. This is unacceptable apathy on the part of the Mexican State, he concluded. On Nov. 27, President Peña Nieto, in his speech proposing government actions in response to the disappearance of the Ayotzinapa students, said he would submit to Congress a constitutional reform initiative to empower it to issue general laws on torture and forced disappearance, further strengthening protocols to prevent officials from committing these crimes, create a national system for tracing missing persons and publish the regulations for the General Law of Victims, passed in May of 2013. 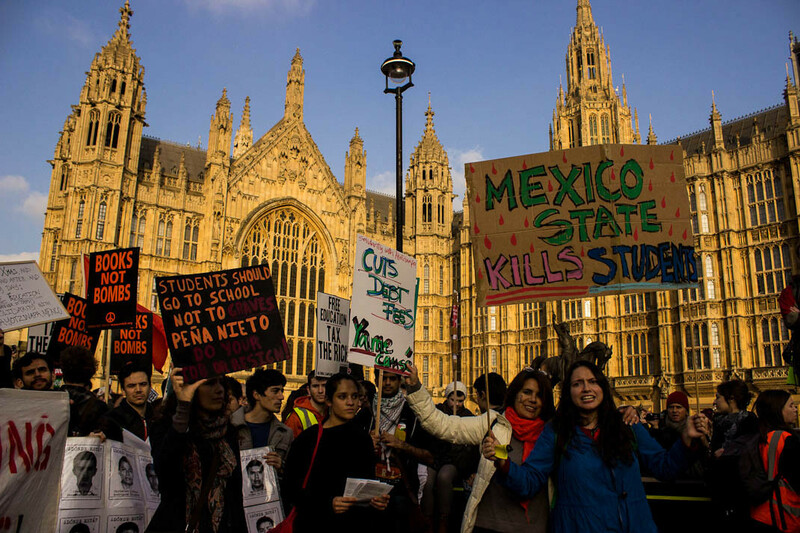 The persistence of actions of solidarity with Mexico abroad has gradually increased and the UK has been no exception. Those who have come together from this area in various acts of dissemination and denunciation, seem to be aligned with Mexico’s current process, where the collective organization of pain and indignation seems to be the next step in the fight against “corruption, impunity, authoritarianism and decomposition of the political class” in Mexico, as César Enrique Pineda says in his November 2014 article. 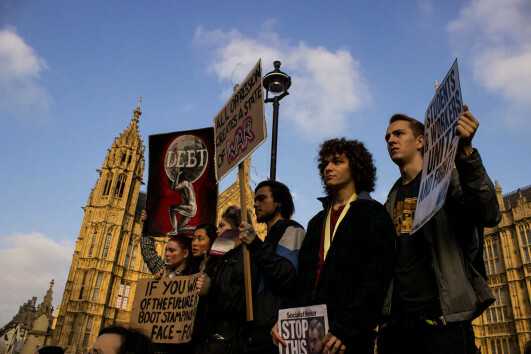 On Wednesday 19 November, thousands of British students took to the streets of London to demand free education and a halt to the austerity policies promoted by the government, giving life to the massive student protest underway in Britain since 2010. 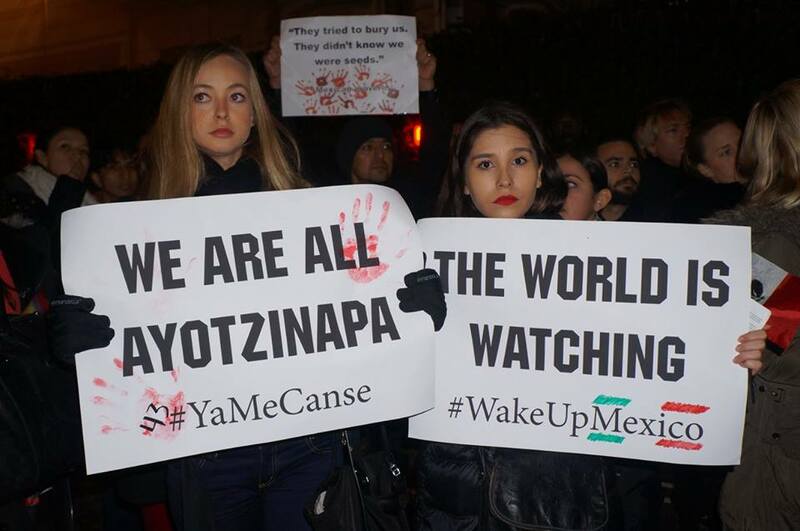 A contingent of about 50 people joined the march who gave themselves the task, with shouts, banners, flyers and Mexican flags to spread information about the current crisis in Mexico, demanding justice and the appearance alive of the 43 student teachers from Ayotzinapa who are still missing. 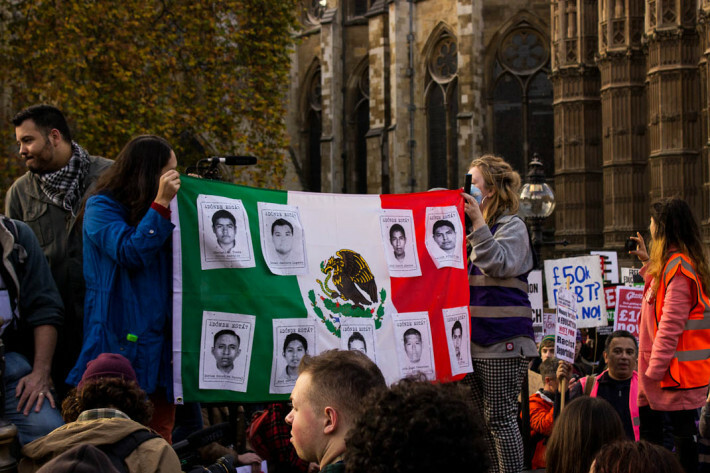 After the march, the English students took the microphone and enabled a spokesperson from for the movement of Mexicans in London to talk about the terrible situation facing the country. 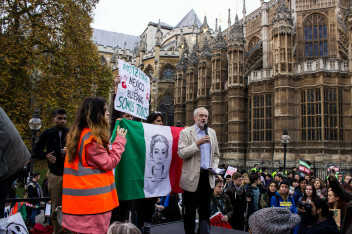 Also, Member of Parliament Jeremy Corbyn, who had filed a motion in the British parliament to denounce the human rights crisis that exists in Mexico, also expressed solidarity with the missing students and called on the world to look to see and to witness what is happening in Mexico, emphasizing the importance of international solidarity. The Ayotzinapa case has become a symbol of the multiple and systematic human rights violations that have been perpetrated with impunity in Mexico under the protection of government institutions. 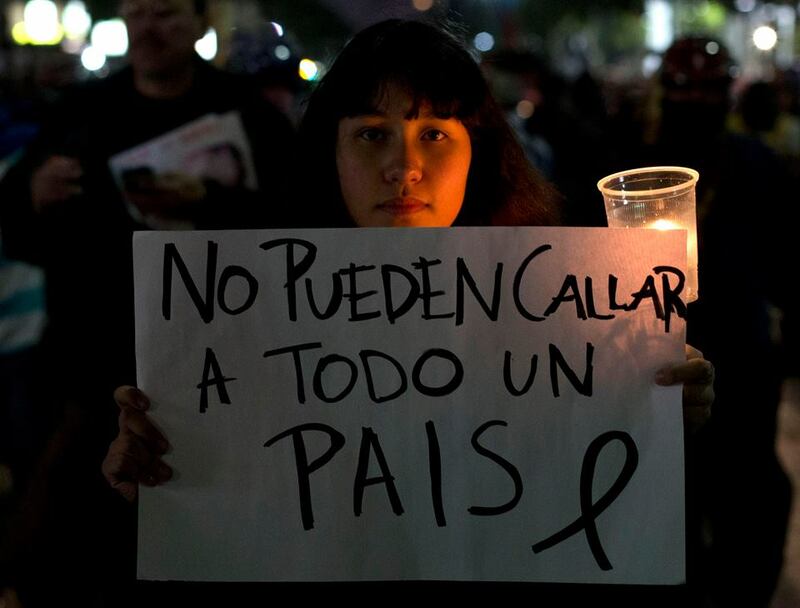 It has also sparked the outrage and anger of many Mexicans who, even from other parts of the planet, have decided to speak out, and with an ‘enough is enough’ [«ya basta»], from the bottom of their heart, denounce before national and international public opinion the role and responsibility of the Mexican state in the reproduction of violence and injustice in the country. 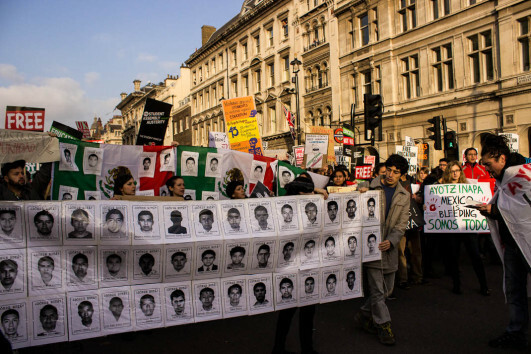 What happened in England is an example of this, since the actions of solidarity with Ayotzinapa started cautiously with a small number of demonstrators. 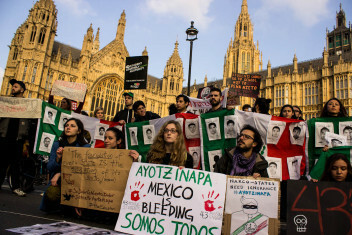 However, week after week, more people moved by the Mexican crisis have joined the protests and have joined spaces of coordination spaces of solidarity with Mexico in cities like London, Manchester, Edinburgh and Sheffield, among others. Today, after two months of struggle, the actions are multiplying, between letters to and to the embassy, ​​leafleting on the streets, talks and calls to different marches and rallies of support from the Mexican and foreign community in the UK for the struggle for justice and dignity in Mexico. … In Mexico each time they are responding in a more organized way (…) and here also we are trying to work in coordination with organizations that already exist and to be open to more people integrating into any activity of solidarity with Mexico (…) now there are many people who have never participated in anything political that are approaching, wanting to do something, hence the importance that there are organizations abroad to work in collaboration. As Monica Maristain said, “Mexico is the talk of the world”. And it is a Mexico “… infamous for the worst reasons. It is crying inside, it cries out and the straw that broke the camel’s back is, for many, the disappearance of the 43 normal school students.” But unfortunately, the 43 are just the tip of a continental iceberg of deaths and disappearances which remain hidden in our funerary country. Yesterday in London, now in Mexico and the world, we again see the faces of the normal school students, and remember that through their eyes and their struggle, they have humanized the horror, they have fuelled our indignation, and. without planning it, they have watered with courage the seeds of a society which in unison is demanding justice. March in San Cristóbal in support of the missing normalistas, against the construction of the San Cristobal-Palenque highway and against violence. San Cristóbal de Las Casas, Chiapas. Thousands of Catholics marched simultaneously in 12 municipalities of Chiapas to demonstrate against the megaproject of the San Cristóbal -Palenque highway; to demand justice for the disappeared of Ayotzinapa, and against violence and alcoholism. In a communiqué they said that one of the megaprojects which they are against is the San Cristóbal-Palenque highway which the federal government plans to build with an investment of over 10 billion pesos. “All the communities and municipalities that this project wants to pass through live in extreme poverty and it is a mockery to say that the superhighway will improve our lives. If the federal and state governments really want, as they say, to benefit the communities in poverty we ask that they use the billions of pesos for that project to complete the 40 hospitals and clinics that corruption has left unfinished for the last six years, and pave the hundreds of rural roads which are in poor condition so we can take out our sick and our merchandise,” they said. In addition, they added, “let them build the intercultural university centres which we do not have, and truly activate the local economies and not just give alms through their welfare programmes which they give out for electoral purposes and to gain control”. They added that “during the last few months we have consulted with our community as to whether or not they want the superhighway from San Cristobal-Palenque to be built, and their answer is no because it will destroy Mother Nature; that it will bring other customs and traditions, it will increase alcoholism and drug sales and it will not benefit the vast majority of poor people, just large companies, business people and perhaps some traders”. 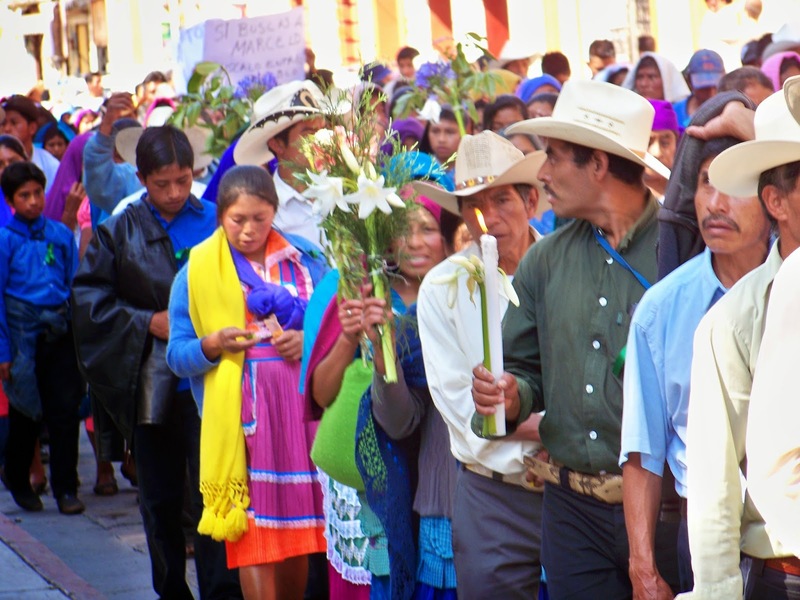 According to members of the Movement in Defence of Life and Territory and the Believing People of the Diocese of San Cristóbal de Las Casas, the marches began at 9 am in the municipalities of Tumbalá, San Cristóbal, Ocosingo, Oxchuc, Yajalón, Huixtán, Cancuc, Tenejapa, Salto de Agua, Altamirano, Chilón and Frontera Comalapa. According to preliminary data over three thousand people marched in this city; seven thousand in Ocosingo; 10,000 in Chilón; a thousand in Oxchuc, and 800 in Tenejapa. In this city the demonstration began in the west of the city, and half way the attendees made a stop at the height of the White Bridge – located ten blocks from the centre of San Cristóbal -, for a prayer, in order “to apologize to mother earth and water because we are destroying them with pollution; they are very soiled and hurt “. The elders and leaders of some communities who led the traditional prayer said “we do not want death, we are in favour of life and so we reject the superhighway”. 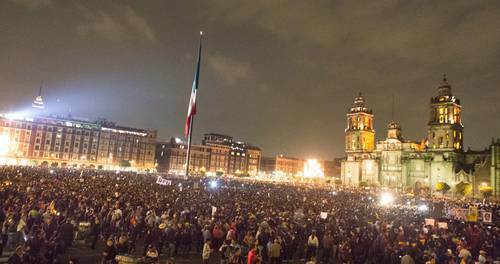 A huge crowd received parents of 43 missing students in Mexico City’s Zócalo on Nov. 20. Photo from La Jornada. The days pass and their sons don’t appear. One day the authorities tell them one thing and the next day another. And the versions that they give them don’t agree with the available evidence. 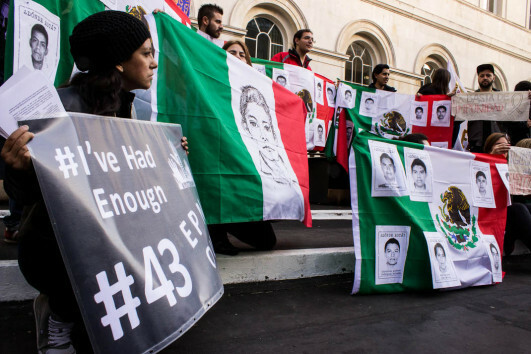 Why should the parents of the 43 disappeared Ayotzinapa students believe the government? The first time, functionaries asserted that the young men were hidden away as political pressure. They asserted that were safe in some place in the mountains or in a corner of their school. Valuable days for finding them alive passed like that, without seriously looking for them. It was clear very quickly that that was not true. But no authority apologized to the parents for that lie. Nobody had the humility to confess that they were wrong. The official story changed on the night of October 5. Iñaki Blanco, attorney general of Guerrero, reported that two detainees had confessed to the murder of 17 of the 43 normalistas. According to Blanco, Martín Alejandro Macedo Barreda, a drug dealer, and Marco Antonio Ríos Berver, a hired gun for Guerreros unidos (United Warriors), revealed that they executed them on orders of a personage nicknamed El Choky. But almost one month later, while cadavers and more cadavers were appearing without a name in a multitude of clandestine graves around Iguala, and the authorities “sought” that the numbers of the dead normalistas would fit, the government’s version of the facts was again modified. Authorities never clarified why those killers who confessed had lied. They simply blotted it out and made up a new story. On November 7, in a press conference, Attorney General Jesús Murillo Karam reported that, according to three new statements, the 43 youths were driven to the Cocula municipal garbage dump, killed, incinerated and their ashes thrown in plastic bags into the river. The new government story about the massacre presents the provisional results of an investigation underway as if they were almost definitive. But it is also full of holes, explanations of little credibility and evident contradictions. In La Jornada, Telesur and Proceso the opinions of various specialists have been documented. They place in doubt the third official version of the facts, the last (as of the moment). We review some of the criticisms that have been made of the official report. To begin with, it would not be an easy thing for the gunmen to submit a group of 43 combat-hardened and rebellious youths, and move them docilely, without leaving any trace, several dozen kilometres from where the police took them prisoner. He assures in the explanation that some suffocated on the road. Nevertheless, the vehicles in which they were transported (a 3.5-ton truck and a small cargo truck) did not have a closed cabin that would impede the entry of air. Why then were they asphyxiated? The garbage dump where the students were allegedly incinerated is an open-air place, in which it is very difficult to attain the temperatures necessary for burning their bodies, much less on a rainy day, like it was that day. Avoiding the fact that the fire spreads to other corners of the dump is a task full of risks. Nevertheless, the gunmen managed the fire superbly. A fire of that magnitude and a stench like that which the bodies emit upon wasting away devoured by the flames would have only with great difficulty have gone unperceived in the region. But nobody realized what happened. Curiously, the steel strips that reinforce the tyres that they used to feed the fire were not found on the burned land. Nor did they find metal buckles from belts and huaraches, zips from trousers and jackets, watches, medals or amalgams from the students’ dental pieces. On the other hand, they did find remains of vegetation that miraculously survived the fire’s infernal heat. It’s also surprising that, according to the detainees’ statements, they had been able to destroy the bones with expertise and pick up the residue scarcely two and a half hours after the funeral pyre was extinguished. Ashes are a very efficient thermal insulation, which can conserve the heat for many hours after the fire is out. It is impossible to put them in plastic bags without them melting. Finally, it calls attention to the reason why the gunmen hurled the ashes into the river in plastic bags, when the intention was not to leave any trace of the crime. And, even more surprising, is that one of those packages had not broken upon crashing on the stony bottom of a river with a vigorous current. The refusal of the parents of the disappeared to recognize the government version as valid comes from not just the natural refusal to admit such a painful fact but also, fundamentally, what they consider an obscene script for shelving the tragedy, and excusing the Mexican State for its responsibility in the crime. Too much time already passed for these parents without their children appearing. They are fed up with the deceit, manoeuvres and the government’s attempt to buy time. The pain covers us. It is not alleviated by the anaesthesia applied by the authorities. Their war of attrition causes fatigue and exasperation, but not paralysis. It feeds the fury. Why Ayotzinapa? In the face of all the dead, all the disappeared, all the massacres we suffered earlier, why didn’t we wake up before? Many responses have been offered. Two of them appear increasingly relevant. Ayotzinapa was the first public and indisputable evidence that there is no way to distinguish between drug traffickers and “police” or between criminals and civil servants. The phrase “It Was the State,” strewn throughout the Zócalo of Mexico City, marked the moment of awakening. Everyone knew for certain what had been until then a mere suspicion or open secret. Now it is no longer possible to deny it. It is them. Another answer goes further: it refers to the way in which public awareness has matured over the years. In 2011 we had a similar awakening when we made our own Javier Sicilia’s “We’ve Had It Up to Here,” and we took on the accusations and demands of his letter to politicians and criminals. On May 8 he stood his ground in the Zócalo, with many thousands rallying around him, and he proposed a pact between civil society and the political classes. Javier Sicilia took this position via caravans across the length and breadth of the country. Those who believed the pact possible and thought that the parties and the government would undertake a serious effort to clean their house now know, three years later, that nothing like that has happened. Ayotzinapa demonstrated that any agreement with them turns out to be illusory and counterproductive. Many thousands, perhaps millions now recognize that we are in a war waged by those above against those below, a war without quarter on all fronts, as years ago the Zapatistas warned us. Many [people], or few—no one knows—are carefully reading the words that the General Command of the Zapatista Army of National Liberation (EZLN), in the voice of Subcomandante Moisés [English translation], directed to the parents and Ayotzinapa normal school students when they visited in Oventic on November 15 (Link: Zapatista [Click: English translation]). 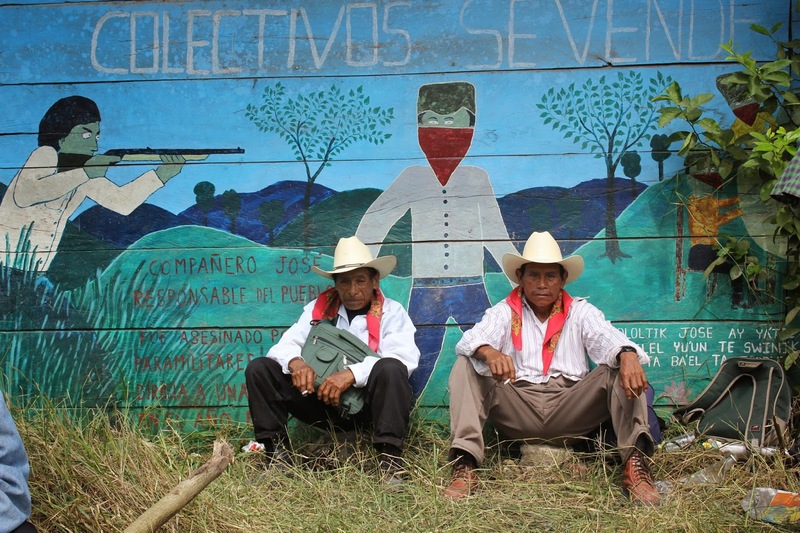 The EZLN expressed their gratitude for their visit, their commitment, their stubbornness. 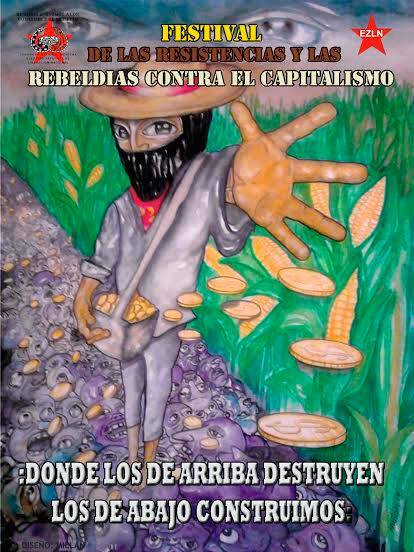 The EZLN recalled that “the entire political system is rotten. It is not that it has links to organized crime, drug trafficking, with the harassment, aggression, rapes, beatings, prisons, disappearances, murders, but that all this is already part of its essence. 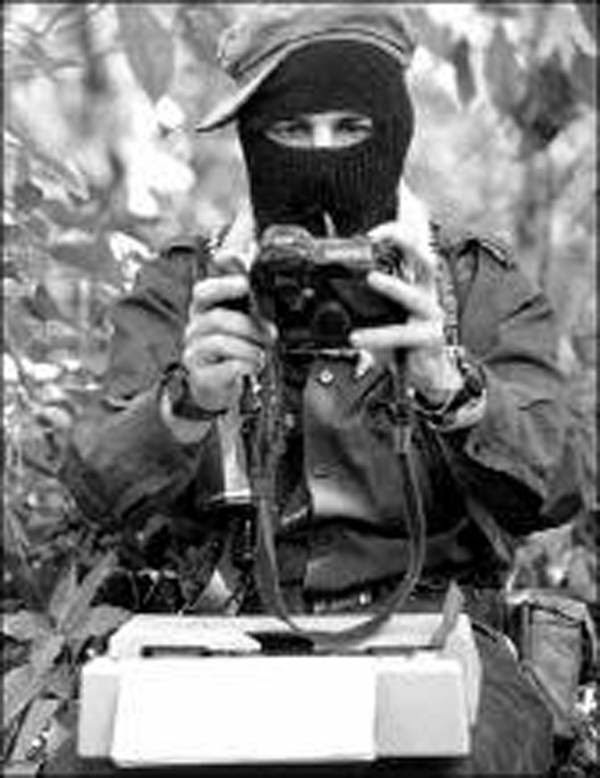 The EZLN told them that their word is strong because in it “millions have seen their reflections. The few are only few until they discover and meet the others. Then something terrible and wonderful happens. Those who thought they were few, and alone, discover that in every sense we are the majority. And that those above are truly the few.” After the meeting, it will be possible to “overturn” the world that we have. This is what the Zapatistas told the Ayotzinapa parents and surviving normal students. And, I believe, they told all of us, men and women, young and old. The disappearance of 43 students from a rural school in Ayotzinapa, Mexico dedicated to training teachers that are mostly from indigenous communities has sparked outrage and solidarity throughout Mexico and the world. These horrible acts of violence must be understood within the context of an increasingly vile and murderous narco state. The outrage has slowly gained momentum and grown into massive demonstrations in solidarity with the families of the 43 students. Though social media has been useful in sharing critical information and calling for solidarity, it is the strong network and infrastructure of independent media and community activists that has responded. Many have been consistently involved in engaging the struggles of the global south while actively working in their local communities. The Ayotzinapa atrocity happened only a few days prior to the 46th anniversary of the October 2nd Tlatelolco Massacre of 1968, when around 500 students were killed and thousands were injured at the hands of police. Similar to the recent events in Ayotzinapa, the 1968 violence was largely ignored by the mainstream media and state political leaders. This silence has been historically imposed by governments and elites as part of a strategy to maintain the illusion of good governance and institutional truth. However, the moments of silence that are most significant in the case of Ayotzinapa have been those that have been reclaimed and used to commemorate, honor, and remember the lives of the current victims of state violence. This silence is not one of apathy, disengagement or withdrawal but one of strategic refusal to participate in the dominant narratives and frameworks that reinforce violent institutions, a silence where participants are able to reflect and listen to each other’s struggles. Though a moment of silence is a common practice when mourning, or as part of a historical commemoration, recently silence has been politicized to reflect, analyze and regenerate community. During the Ferguson October, where thousands marched in St Louis, Missouri, a four-minute moment of silence was observed to represent each hour in which Mike Brown’s body, who was shot and killed by a police officer on August 9thof this year, was left lying in the middle of the street. This is a silence that reminds us to speak and listen to each other, not to bureaucrats or politicians who either don’t know how to fix the problem or simply make the situation worse. This should not be misinterpreted as a call for silencing voices or demands. The Zapatistas from Chiapas, Mexico continue to remind us of the possibility of a non-institutional alternative that is built by ordinary people and sustained as a politics of everyday life, through the construction of schools, clinics, community-based forms of governance, made visible by the Juntas de Buen Gobierno, and the efforts toward autonomous justice that is applied through collective agreements. 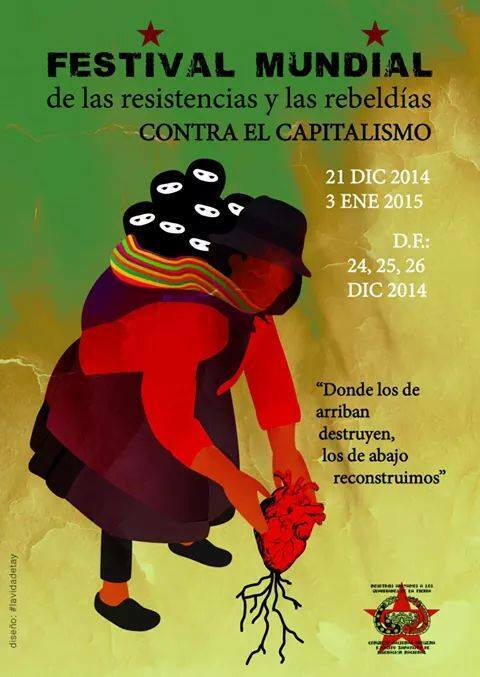 Recently, the Zapatistas have maintained a very deliberate and strategic silence. This is not a silence of resignation, defeat or dismissal; they have been in a very active dialogue with people from all over the world, through communiqués and encuentros, as well as through their participation in public actions in solidarity with communities across Mexico. Through these public demonstrations we see that the Zapatistas have not only been able to listen to struggles from all over the world but have also been responding. While the silence of the state reinforces its complicity in maintaining the drug war and the immense violence against the people of Mexico, the silence from below speaks of a shift in focus, where those at the grassroots speak to each other, build on their level of organization, and reinvigorate their commitment to struggling for a radically new type of politics. By: Eréndira Derbez and Gisela Martínez. Translation by Diana Soto. Mexico City, november 23rd.- Yesterday, the Attorney General’s Office (PGR) relocated the 11 people who were arbitrarily detained in the downtown area of Mexico City in the context of actions in solidarity with Ayotzinapa, on November 20th. These actions demand the presentation of the 43 education students who were forcibly disappeared by the municipal police of Iguala, Guerrero. After being detained for 18 hours by the Assistant Attorney General for Special Investigations and Organized Crime (SEIDO, a department of the PGR), 3 women and 8 men were accused of criminal conduct, rioting, and attempted manslaughter according to the preliminary investigation labelled PGR/SEIDO/UEITA/194/2014. This document was signed by the Federal Public Prosecution Minister, SinuéDomínguez Campos, who reports to the Specialized Unit of Investigations on Terrorism, and Arm Stockpiling and Trafficking. According to the collected data, the 11 people were beaten up prior to being arbitrarily detained, and there is no evidence that they had committed any crimes; some of them did not even participate in the marching demonstration which departed from three points of the city, Ángel de la independencia, Monumento a la Revolución, and the Plaza de las Tres Culturas de Tlatelolco. Nonetheless, the police detained them only for being in the downtown area, for non-protest-related reasons. Lawyers, organizations, and family members filed an official complaint for egregious violations to the judicial process. The detentions were arbitrary and the arrestees were brought to the Public Prosecutor more than 12 hours after their detentions (during this time their family members and friends did not know their location). The arrestees were also prevented from being able to access their civil right to adequate legal counsel: the PGR kept them in isolation, impeded them from talking to their personal lawyers and assigned them public defense lawyers instead. While in isolation, the families had no knowledge about the arrestees’heath conditions, whether or not they had received medical attention, or if an official evaluation about their physical conditions had been conducted at the time they entered SEIDO facilities. Once the detainees were assigned a jurisdiction for their cases, they were relocated to federal jails. Women were put in the female jail of Tepic, in the state of Nayarit (where the drug trafficker known as the “Queen of the Pacific”was imprisoned), and the men were relocated to the federal jail of Villa Aldama, in the state of Veracruz. Most of those who have been imprisoned in the federal facilities express that they are exposed to human rights violations —their treatment is cruel, dehumanizing, and humiliating; this is contrary to the Standard Minimum Rules for the Treatment of Prisoners published by the United Nations and more broadly of the Human Rights Declaration. Furthermore, the distance between Mexico City and the areas of relocation in Nayarit and Veracruz increase the difficulty of the judicial defense. Contact with their families is broken and this too breaks with international normative standards. Who are the eleven detainees? 1.- Tania Ivón Damián Rojas: 21 years old, 3rd semester student majoring in sociology at the National Autonomous University (UNAM). According to her family members, the complaint is that she was beaten by federal police agents (she has bruises on her arms and contusions on the right eye). 2.- Hillary AnalíGonzález Olguín: Political science student at UNAM. The complaint is that she was brutally beaten, her ribs are injured, there is an internal hemorrhage in her eye, and her face was hit. According to her family, federal police agents threw her on the floor and kicked her. 3.- Liliana Garduño Ortega: Continuing studies high-school student, single mother. She was taking pictures near Zócalo (the main square) when she was pushed by a group of people who were running from the police. She was then grabbed by police agents who kicked her head when she was knocked to the floor. She has severe contusions. 4.- Isaac Domínguez Ayala: 31 years old, former student of Psychology at UNAM. He was arbitrarily detained during the November 20th operation conducted by Federal and the Mexico City police. Some family members report that no one has been able to see him (as of 12pm, November 22nd); there is no information about his health situation, and he was not allowed to choose legal aid. Isaac works at Revolución Hotel. The last time he was in communication with his family, he said he would join the march demonstration in the company of Atzin (also a detainee). He was wearing a blue and yellow shirt; out of fear, when he was detained, he gave the false name of Ramón (this is the name that appears in the detainees lists). 5.-Laurence Maxwell Ilabaca: 47 years old, he is a PhD student at UNAM getting a degree in Spanish literature. Besides being a musician, he had the nickname of “Moro”(The Moor). He was detained while buying tamales. He did not participate in the march demonstration. His migratory situation is complicated given that he is a citizen of Chile and could be deported. The Chilean Embassy has not provided consular advisory and his lawyer was assigned by the local authorities; he has not been allowed to change for a lawyer of his own. 6.-Atzín Andrade González: 29 years old, art student at La Esmeralda, school of the National Institute of Fine Arts (INBA). He was part of his school’s marching group, however he got lost during the march and then was cornered in the area of conflict. 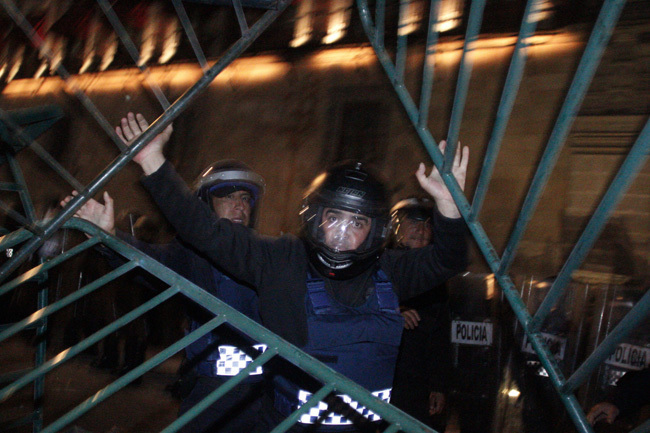 He was detained in the Zócalo. He was hit on the legs which prevents him from walking well. 7.-Hugo Bautista Hernández: 22 years old, 3rd semester student at UNAM, majoring in sociology. His family states that while he was detained, he was brutally hit by agents of the Mexico City police and the Federal police. His ribs and one of his eyes are severely injured. 8.- Juan Daniel López Ávila: 18 years old, he is a member of the Guelatao Cooperative and the Independent Popular Front Francisco Villa (FPFVI). 9.-Luis Carlos Pichardo Moreno: 45 years old. Graduate from Film University (Centro de Estudios Cinematográficos). 10.-Roberto César Jasso del Ángel: 20 years old, student from Ecatepec in Mexico state. 11.-Francisco García Martínez: we have no information. The Attorney General’s Office confirmed yesterday that it had sent to maximum security prisons in Nayarit and Veracruz 11 detainees from the demonstration on November 20 in the Center of Mexico City, held to protest the 43 normal school students Iguala who were disappeared nearly two months ago in Iguala, Guerrero.Among those detained, accused of crimes that include attempted murder, conspiracy and riot, are students and activists like Laurence Maxwell Ilabaca, a Chilean citizen, who, according to the Foreign Ministry of his country, had no part in the confrontations between protesters and riot police, and the visual arts student Atzin Andrade Gonzalez, whose arrest was videotaped and broadcast on social networks. Their arrrests are part of the cluster of abuses and arbitrary arrests committed by the capital police during the events last Thursday. 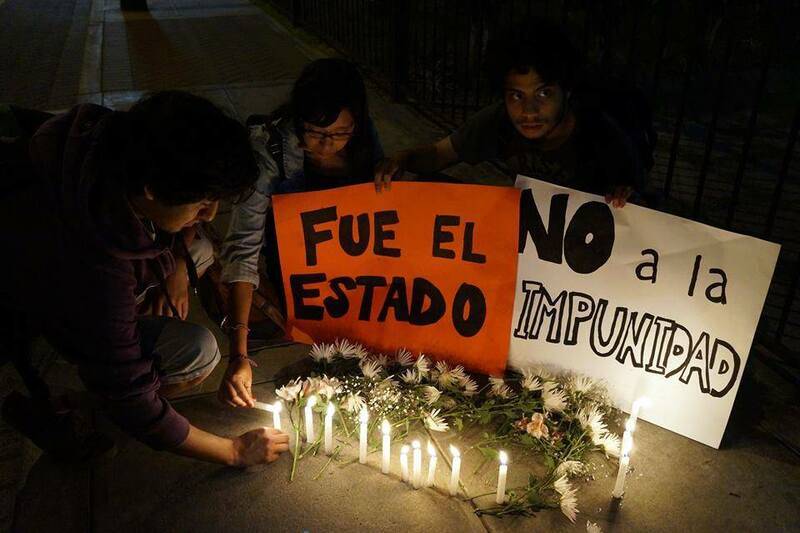 It is regrettable, first of all, that a protest for a crime committed by a police force, as is the case in the murder and disappearance of the student teachers in Iguala on September 26, is reinforced with abuse by authorities against innocent citizens. The arbitrary and baseless arrests result in a violation of the law by those in charge of seeing that it prevails, weakens the rule of law, accelerates the discrediting of government institutions and increases the discontent already traversing the country. Moreover, as reprehensible as is repeated police abuse against innocent citizens, the inability of the police to distinguish between innocent people and possible suspects, and the unjustified detention of random people, it is even more reprehensible that citizens who are arrested in these circumstances receive treatment similar to that of murderers, drug traffickers and kidnappers, and that they are sent to federal prisons with unusual speed by the institutions that administer the enforcement of justice. In this regard, it cannot be ignored that, in the two days since the repressive excesses of the capital and federal police during the historic demonstration on Thursday, the federal government has made statements trying to justify the excessive use of force and to criminalize social protest at a time when the sum of indignation that traverses the country has been articulated regarding the demand for the search for and finding of the 43 normal school students kidnapped in Iguala. As can be seen, this trend has moved from words to deeds, while the arbitrariness with which the police acted to disperse the crowd and the actions of the prosecutors who consigned the detainees cannot be understood as anything other than a means of intimidating those who have participated in these mass actions and of inhibiting the realization of future demonstrations. Such a perspective is unacceptable, because it would reveal a government that has not only been unable to provide a single hard and credible piece of information on the whereabouts of the 43 missing students, but also that is beginning to focus more on silencing and suppressing expressions of discontent aroused by that crime than to clarify it. We wish to express our deepest alarm and anger over the repressive actions that the government of Mexico has systematically demonstrated in response to the public unrest generated by the disappearance of the 43 students from Ayotzinapa’s Teacher’s College. 1. We alert governments, media and international organizations to the risks involved in criminalizing and repressing civil protests in Mexico. The use of State forces is not the solution to the political unrest that the country is experiencing, and this approach only increases Human Rights violations and conflicts between citizens and the government as well as violating the citizenry’s rights of political expression. 2. Claims made by government officials that the social movement and its media are part of a destabilization campaign are very disturbing and must be rejected. 3. We support the intervention of the Inter-American Human Rights Commission of the OAS in the cases of extrajudicial killings and disappearances in Mexico. The international Community must demand that the Mexican government respect the human rights treaties it has signed. 4. We demand the immediate release of the demonstrators who were arbitrarily arrested on November 20th, 2014, during the peaceful demonstration in Mexico City’s Central Square. We demand that the charges the judicial apparatus has filed against these citizens be retracted and that the authorities stop their transfer to remote prisons where they do not have legal assistance. We firmly denounce violations of the judicial process, including the hindering of defense attorneys from seeing their clients and providing proof of their innocence. The liberation of political prisoners is crucial for the restoration of the credibility of Mexican institutions. We urge a fast response from the authorities and the recipients of this letter. He said that actions are planned through social networks with the dissemination of information, communication of the families with individuals and groups from other parts of the world, a graphic campaign with posters; visits to embassies and offices of the federal government together with the forcibly displaced. 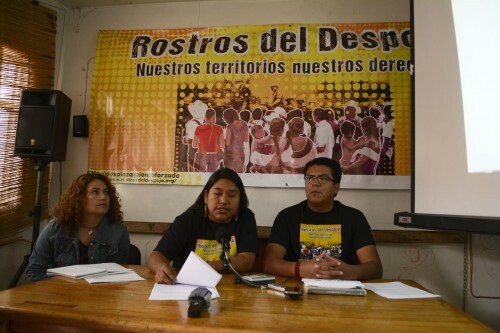 López Rodríguez said that the campaign started today because it coincides with the eighth anniversary of the “massacre” which occurred on November 13, 2006 in the community of Viejo Velasco, Ocosingo, where six people were murdered, 36 remain displaced and two more are reported as missing. He noted that in addition to this case, the campaign will include that of Banavil, municipality of Tenejapa, where four years ago 7 people were displaced, who to date have been unable to return, and that of San Marcos Avilés, Chilón, where over a hundred people who returned four years ago, continue to receive threats of expulsion. The organizations leading the campaign are: la Casa de la Mujer Ixim Antsetic, A.C; el Centro de Derechos Indígenas A.C; el Centro de Derechos de la Mujer de Chiapas, A.C; el Centro de Derechos Humanos Fray Pedro Lorenzo de la Nada, A.C; Frayba; el Comité de Defensa de las Libertades Indígenas (CDLI–Xi´nich) and Salud y Desarrollo Comunitario A.C.